Thank you to everyone who supported our annual road races. We had a great turnout in the juvenile, the special needs race and the 5k road race. We had clubs from all over Ulster attend alongside all of the clubs from County Monaghan. We want to thank everyone who helped and organised this event, the Red Cross, Murphys sound, Peter McKenna, Champion Chip timing, the Oaklands centre, Packie McGee, Rory and Peadar for photos. Thank you to our main sponsors Castle Leslie and to all the other sponsors. Thank you to all the parents and everyone else who volunteered at the line, at registration, making refreshments and who marshaled. It would be impossible to individually thank everyone who helped out in making this event a success, see you all in 2019. Well done to all our senior runners who ran our annual 5k, you all did great. It was great to see such a large turnout of Harriers in our 5k race, thank you for supporting this event and for representing our club so well. 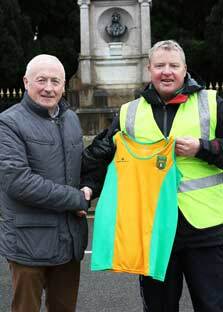 Thank you to Micheal McQuaid of Upstairs/Downstairs for sponsoring our new Senior Club vests that he presented to our senior runners that were present at our annual road races on Monday the 2nd of April. We want to thank Micheal for these vests from all our senior athletes and wish them luck to wear them.